The Hindenburg disaster will probably always be remembered as the singular event that killed airship travel. In truth, there were other events that occurred which also contributed, but none stand out in the public consciousness more than the demise of the Hindenburg. The image of that huge ship falling from the sky and erupting into flames before burning to nothing in seconds was too jarring for the public to ever put their trust in these giants of sky again. However, few realise that the disaster, though terrible, wasn’t as bad as it seemed at first glance. For example, more than half of the people involved in the crash actually survived it. The final death toll for people on board was as follows: of the 97 people on board (36 passengers and 61 members of the crew) only 35 of them were killed. (The actual death toll is logged as 36, since the crash also killed a crewman working on the ground. A German Shepherd dog, Ulla, aboard also lost her life, if you want to count the canine.) This puts the survival rate for humans in the disaster at well over 60%, though 100% of the dogs aboard were killed, which presumably had the effect of dogs the world over swearing off airship travel. However, not all the passengers were as lucky, with some opting to leap from the craft when it was still high in the air, sending them plummeting to their inevitable death. Several passengers who didn’t have a chance to escape before the ship hit the ground were also later pulled out of the wreckage alive, meaning the people who leapt to their deaths would have almost certainly been more likely to survive if they’d stayed on the giant exploding airship. So the ones who kept their heads and the ones who were deer in headlights seem to have had the best survival strategy over the “OH MY GOD THE SHIPS EXPLODING! !” jumpers. On the evening of May the 3rd, 1937, the LZ 129 Hindenburg, now colloquially known as “The Hindenburg” was preparing for its final and history changing flight from Frankfurt, Germany. The airship sailed for 3 days with no incident until around 7 PM on May 6th as it approached the Lakehurst Naval Air Station which coincidentally is in Lakehurst, New Jersey. It’s noted that the airship went through its usual docking procedure for around 25 minutes before the very first signs that something terrible was about to happen presented themselves. At approximately 7:25 PM, eyewitnesses at the time claimed that they saw a “glowing aura” coming from the tail section of the ship. This aura was later presumed to be either fire or static electricity. Regardless of what the aura was, the entire ship was soon in flames and within seconds it had burnt and crashed to the ground. As for what caused the fire, again, no one is entirely sure. Airship crash investigation techniques weren’t exactly top notch back in 1937 and even today, the cause of the fire is a source of a significant amount of debate. That being said, at the time of the disaster, many theories were put forward. 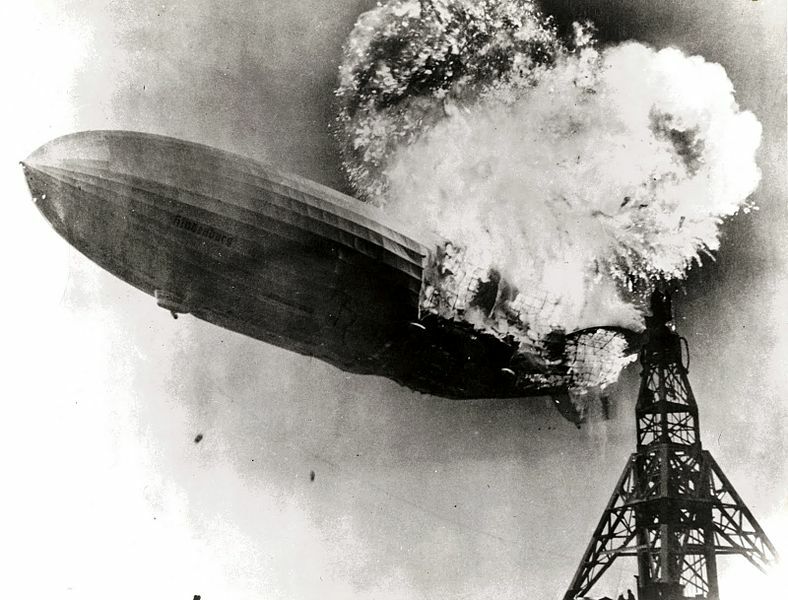 The two most enduring were that the fire was caused by sabotage, and another that claims the fire was the result of static electricity igniting the hydrogen the Hindenburg used to fly. Not surprisingly, the sabotage theory has been largely debunked owing to the fact that there was zero evidence of any sabotage at the time, and no one has managed to come up with any tangible evidence since. As such, most sources today agree that the fire and resulting crash was the result of an accidental static spark of some kind. This is also largely believed to be the cause of the mysterious “blue aura” eyewitnesses claimed to have seen. So what caused the static charge? Originally it was believed that a static spark of some sort was perhaps caused by a build up of electrical potential on the craft from friction between the Hindenburg and the ambient air. There was probably a difference of potential between the skin of the craft and the internal frame, as the cords used as separators provided insufficient conductivity to keep the charge equal; thus, a spark occurred igniting the hydrogen within the airship. This is more or less what was concluded in the original investigation back in 1937. Yet, modern investigators have come up with a slight twist on that theory. This second theory, first put forward by NASA scientist and hydrogen expert, Addison Bain, states that that spark that probably caused the fire most likely ignited the Hindenburg’s coating first, instead the hydrogen within it. But in either case, the result was the same: zzzzzt -> Boom -> IT BURNS US!!! -> OH THE HUMANITY!!! Arguments have been thrown back and forth for both theories, culminating in a special Mythbusters episode where it was concluded that it was indeed the hydrogen that originally caused the fire. Which of course just caused more arguments- proof if it was ever needed that people should never try and prove things… or really try anything at all. You know what the first step towards failure is? Trying to do something. The Hindenburg crash is the source of the famous and oft repeated phrase, “Oh the humanity”, it was uttered by one, Herbert Morrison during a live radio broadcast of the landing. The recording is often played over footage of the crash and is probably the most well known audio associated with the wreck. Interestingly, Morrison’s recorder just so happened to be running slow that day, as such, his recording is often played too fast, giving his words a hurried and urgent feel. The playback speed is not often corrected due to fitting so well with the footage. You can here his recording as it would have originally sounded, here. Famed German acrobat, Joseph Späh, who owned the dog previously mentioned, leapt from the airship while it was still 20 feet from the ground and broke his ankle. Not only did he not go back for the dog, but some suspected him of being a saboteur. Though, in truth, the main “evidence” against him was simply that he visited his dog in the cargo bay numerous times during the flight and supposedly seemed impatient for the ship to land before it burst into flames. The dog was said to be a gift for his children, who were presumably none to pleased when he came home without it. Some eyewitnesses of the time reported seeing St Elmo’s Fire, a unique and rare weather phenomenon, occurring on the tail end of the Hindenburg several minutes before the fire and crash. This is yet another one of the proposed causes of the spark that started the fire. Yet another theory, which most think highly unlikely, was that the fire wasn’t from static charge at all, but from one of the ship’s motors backfiring and sending off sparks. Crew member Robert Buchanan claims the backfire really did happen when one of the engines was put in reverse, but the sparks from the exhaust would not have been anywhere near hot enough to ignite the hydrogen. In addition to that, the fire didn’t start anywhere near the engine in question, further making this theory unlikely. Fascinating. http://avogadro.chem.iastate.edu/MSDS/hydrogen.pdf / http://www.hse.gov.uk/research/rrpdf/rr615.pdf claim that the auto-ignition temperature of hydrogen is only 565C. It’s interesting that the “engine sparks” in this case were as cool as they were, since sparks are a common form of ignition for flammable/explosive gases.